Volunteer at the Goleta Fireworks Festival. 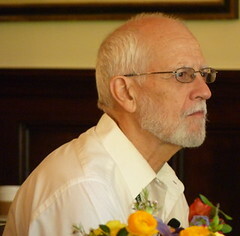 Talk to Walt Stephens. Maurice Moreno and Kimberly Coley received their blue membership badges. 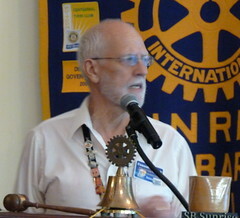 President David Velarde inducted Joe Clark into the Rotary Club of Santa Barbara Sunrise. Membership Chair David Vo gave Joe his new member kit. Darren Doi will be Joe Clark’s mentor. Joe said our club is a good fit for his energy and interests. Real happiness is helping others. Jim Ruh announced the ad hoc fundraising committee will meet for 5 minutes after the step down. 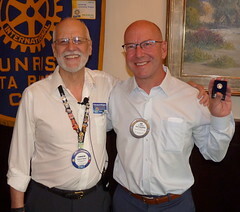 Past past president Joe Weiland passed the past president pin to David Velarde. David Velarde presented the president pin to Betsy Munroe. Betsy Munroe passed the president elect pin to Dana Goba.